Dr. Gökhan Gür´s career in the field of hair restoration and hair transplantation began in 2003. Since the beginning he specialized in the modern and gentle FUE hair transplant (Follicular Unit Extraction). Dr. Gür performs exclusively hair restoration surgeries. Beside the “normal” hair transplant, where the head is shaved completely he offers procedures without shaving the hair, beard/facial transplants and PRP treatments for hair loss or in combination with a hair transplant surgery. 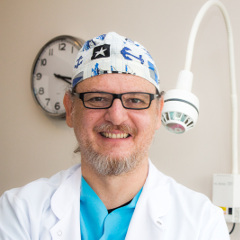 Dr. Gökhan Gür has personally carried out more than 2000 procedures with the FUE technique to this day. Just like our other affiliate doctors, he performs the most important steps and the majority of the surgery himself – including the consultation and hairline design, extraction of the grafts and the opening of the recipient channels (slits). Two assistants, who exclusively work in the field of hair transplantation, support him in his interventions. Only one patient is treated per day. In a one-day session up to 3500 grafts can be transplanted while in a two-days session up to 4500 grafts can be transplanted, if the donor area of ​​the patient is sufficient.